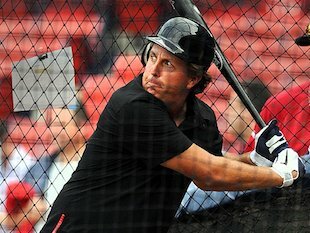 Phil Mickelson is swinging for the fences. â" PGATour.comThe San Diego Padres are having a rough go of it in the National League West at the moment. Losers of their last four and 16 games below .500, there's a pretty good we won't be seeing them in the playoffs this year. That has to frustrate Phil Mickelson, a life-long Padres fan who grew up in the area. But unlike most fans who lament about their team's current plight and dream of one day being able to do something about the quality of the squad on the field, Mickelson has the cash and the time to do something about it. As the San Diego Union-Tribune reported, Mickelson a group of investors are in the process of lining up a bid to buy the Padres.Â And he's ready to be more than the face of a potential billion-dollar-plus bid. Lefty's apparently also going to put his money where his mouth is, confirming that "given the price tag, it's going to be a significant amount." "Growing up, the Padres were my team and still are," Mickelson said Monday. "I always had a love for the team. But (recently) I just felt disassociated with the organization a little bit as a fan. I just know I didn't identify with the players or have an emotional connection. "Where I want to get involved is I want to get a personal involvement with the players and the community â" personal interaction with fans, more community outreach. I want to create an emotional tie with the players and the community." If you'll recall, Mickelson's love affair with baseball stretches far beyond his just being a fan of the Padres. He tried out for the Toledo Mud Hens (Triple-A) in 2003, throwing batting practice to the Akron Aeros but never getting a chance to start in an actual game. Needless to say, Mickelson enjoys being around baseball. And if he can somehow help turn the Padres around with some extra cash, more power to him. Although, I doubt being part owner of the team would afford him the opportunity to take the field in the future. With a couple extra pounds on his frame, I think it's safe to say his playing days have passed him by.